Salon De Uelespieghel, workshop weekends with various maestros. One night with DJ Torito. 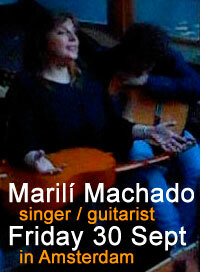 Concert 17.00 - 19.00 hrs + dance till 20:00 hrs, in café of the AAC, Oudezijds Achterburgwal 235. Gratis. Space to dance in front of the orchestra. March 22, 2019: Pannonica saxophone tango quartet. In the break and after the concert: DJ Torito. Rob dances Argentine Tango since 1991, and took classes at the Academia de Tango, participated in workshops from other local teachers, and Argentine dancers visiting the Netherlands (Antonio Todaro, Pepito Avellaneda, Claudia & Esteban, Gustavo Naveira, Tete Rusconi, Osvaldo Zotto & Lorena Hermocida, Carlos Gavito or at festivals in Europe (Fabian Salas and many, many others). Because of his 'energetic' style of dancing in his early years, he was nicknamed 'Torito'. He went to Buenos Aires a few times to experience the Argentine tango culture at its birthplace. In the past years, Rob taught dance classes organised by Tangoschool Amsterdam, Tangoschool Rotterdam and Tangoschool Amsteltango, Tangation in Culemborg and occasionally for schools in Italy, England, and Singapore and a Tango+salsa holiday in Spain. Now, he teaches on invitation of event organisors or dance schools or gives occasional private classes. Rob does not run a dance school. There are no regular group classes! Learn the basics of tango in 6 intense lessons: technique, improvisation, music. You'll learn much faster than in a group lesson. You may want to work on specific subjects, like: corrections, another style (close embrace or more open), performance, techniques for a more active role of the lady, in the creation of the dance. You and your friends may want to organise a lesson for a small group. If you know the date, we'll find a studio, or you do. A private lesson (75 minutes) costs 45 euro (one teacher), but payed in advance, you can have 6 lessons for the price of 5. The lesson is often given by one teacher, and taken by one student. Beginning couples however must take at least two lessons with 2 teachers (80 euro per lesson), before they can have a lesson with one teacher only. NB. The gratis 6th lesson is given by one teacher (Rob). NB. For this price the lessons are given in Amsterdam at your home / or your office / your studio. 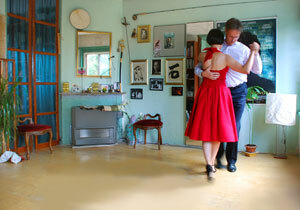 If necessary, a studio can be rented on your costs, but not much space is needed, to dance Argentine tango. For people not living in Amsterdam: call, or send an email, and we see what the possibilities are. Musicality, creativity, personality and expression. Standing secure, dedication to the partner, a pleasent tension, comfortable, relaxed, taking care of yourself. With lots of attention for the lady, who makes half the dance. These are the basics, of the technique and of the ideas from which we dance. 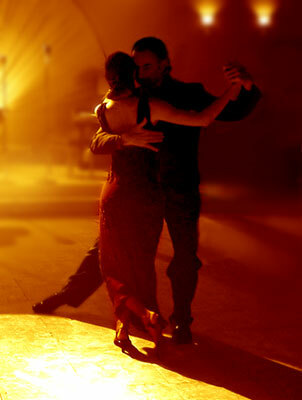 The pleasure of dancing tango comes from the contact that is essential for improvisation. First after we learn what it means to really dance together, we should expand our repertoir of steps. The students themselves should understand that they themselves could also invent steps, moves, combinations, since all steps are once invented, by someone creative, who dared to. A step could not be copied if no one had created it first. No one dances the same way and no one should try become a copy of his teacher. Nor should a teacher think his/her style of dancing should be copied. And nothing should be copied before it is understood and experienced as valuable. The style of your tango dancing will be shaped after your body, energy, mood, preferences in music but also by your favorite dancepartners who'll still all have their unique qualities, capabilities and desires. Two, unique persons, dancing together, should enjoy the dialogue. Dancing Tango is not about the leader, telling the follower which step to make, in which direction and with which speed. But it is also not about the follower waiting for an opportunity, given by the leader, to throw her own few seconds of creativity into the dance. The leader must learn to be sensitive for the followers creativity and the follower must learn to communicate her wishes while dancing (and without speaking a word!). Advanced dancers may have developed an automatism, in dancing patterns, without realising they have lost the pleasure of the contact that comes with improvisation. For them it would be good to do excercizes that make them aware of the loss, and regain the pleasure of more adventurous dancing. Although I consider teaching steps the least important, one should not be afraid not to learn any. Every lesson contains steps that fit best to the theme of the lesson. 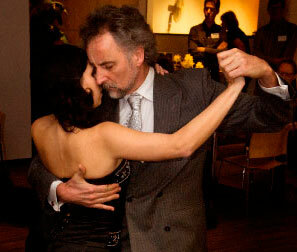 The song (a milonga) 'El Torito' has in its name and its speed some relation to Robs dancing. Postcards with these images have been sent, from Buenos Aires, by Ricardo 'El Holandes' and Hans & Yolande Gerver. Thanks guys! Maintaining the best viewed Tango pages in the Netherlands has become a daily task, since all visitors expect this Tango Agenda to live up to its promises and be complete and up to date. Then there're the webpages that are consulted worldwide, by hundreds of viewers every day. All together a wellrespected set of Tango pages where many request to be linked from and through which many find their way to Tango in any country they wish to travel to. Enthusiasm about the skill of professional dancers and musicians and his wish to see the right artists be booked for the right jobs, made him start a service for event organisors. 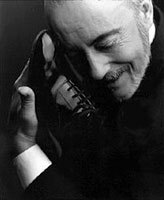 Those who seek Tango musicians and/or Tango dancers can be assured of the best help one can get. Event organisors of theaters, festival organisors, large companies, television- and radiomakers used the insights and contacts build upon 2 decades of Tango experiences, through Torito Events (This is not an agency. Torito Events is hired by the event organisor, not by the artists). April 24, 2017. Amsterdam, DJ in Milonga Mi Lunes. Photo Henny van den Berg. 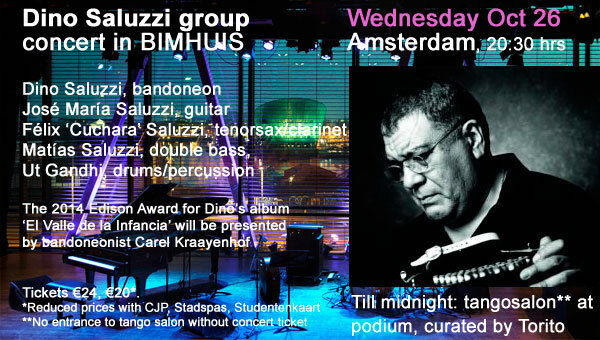 Bas Knuttel: Went to this concert... and I was completely struck by the subtleness of Dino saluzi and his family. Every one of them playing their instrument so refined and together so harmonious. Not one dull or 'over the top' moment, from the first to the last note pure -as in sincere-music of the highest quality. Bought the cd Navidad de los Andes with a violoncello in the line up... and their work in the studio is just as sincere. I'll definetely try and see them again and recommend it to everyone who is not just interested in the bandoneon in standard tango role. But this Music definately had a 'state of tango' all throughout the concert. pS and thanx Rob Torito for bringing this concert to our attention and organizing the salon afterwards. Moon Tummers: Ik vond het onverwacht mooie muziek. Heb genoten, ook van het intieme salonnetje er na. 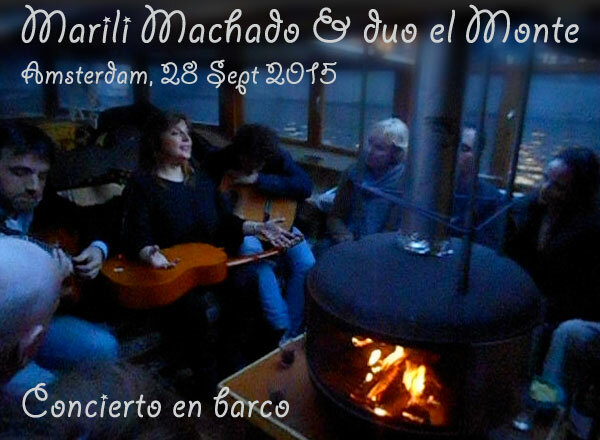 Nightly afterparty on a boat during which Marilí generously played many other songs of their vast reportoire. with a private early evening boat trip trough the centre during which the trio generously played much of their on stage reportoire. Boat trip connected to teatro Munganga, where a few songs were played as well. The trio was in NL only this one day, an intermezzo of their European tour. A serie of performances organised by Le Champion, for the occasion of the Van Dam-tot-Dam Walking Tour. The podium delivered was not danceable, so we choose to dance on this blue tarp instead! 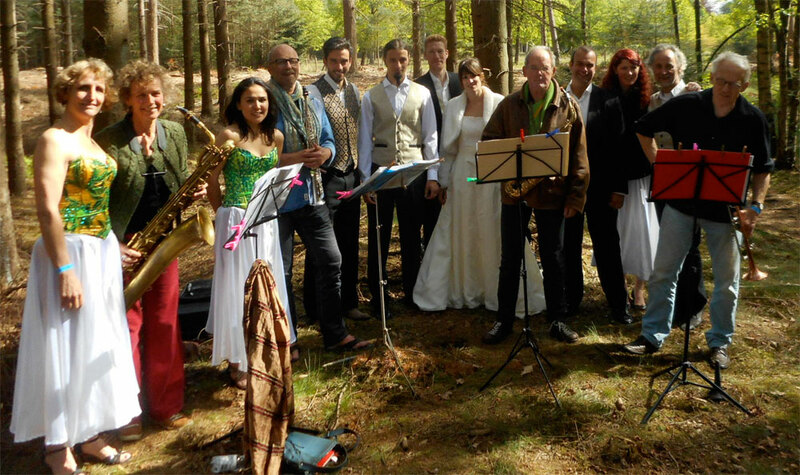 Actors, dancers and musicians after the final rehearsal for their performance at the Vuurol festival, May 24 and 25, 2015. 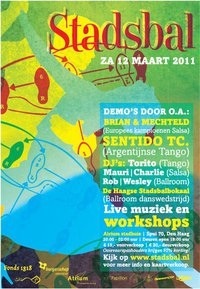 Put together by Dance school Cielito and Theatergroep het WEB. 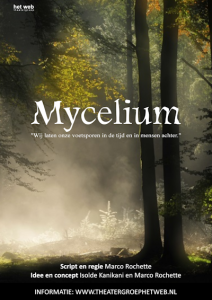 Location: in the woods near Lage Vuursche, behind the castle Drakenstein. NB: This performance is one of a whole variety of performances offered for the single entrance ticket. Rob & Marit in a 4 minute act with a 'deadly' tango dance, on live music ('Assassins Tango'), for 'De Rode Draad', a 75 minute concert/theatre piece by students of the School For Young Talent at the Royal Conservatory of The Hague. Rob & Isolde dance for a world congress of advocates in Amsterdam as an appetiser for a next congress taking place in Buenos Aires. Torito Event was asked to pick 4 dancers who'd perform the Argentine tango for a Dutch movie, in a scene recorded in the night of July 7th 2010. 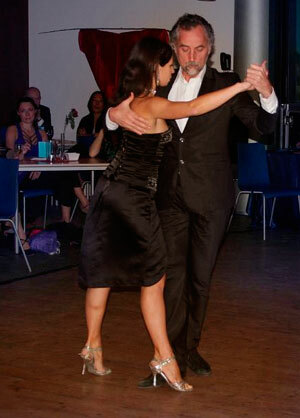 Rob dancing with Erica in a tango salon in Amsterdam in April 2010. Photo by tango photographer Peter Forret. Click for the whole picture. 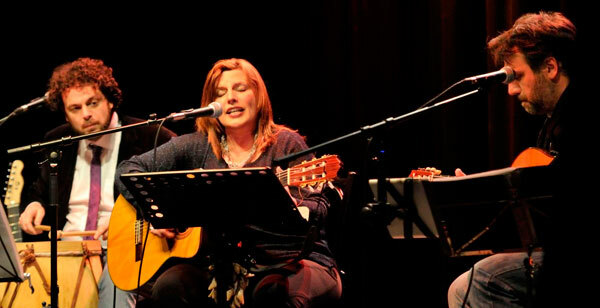 Rob & Manuela (Ribeiro), performance, Tangation, Culemborg. December 2009. Photo © Ellen Verhagen. Rob & Claudia gave a 2 hour clinic about leadership, for the managers of a very large insurance company. December 2009. Photo by the chauffeur. 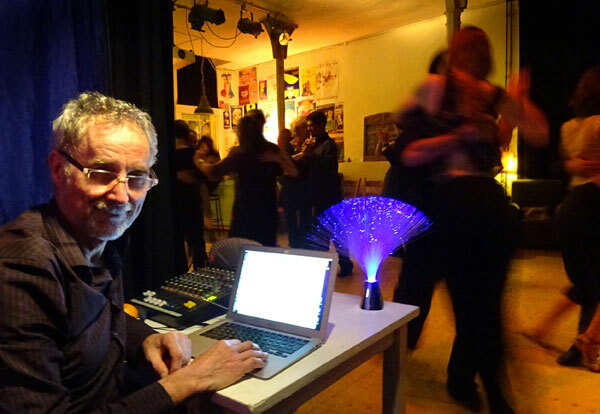 The teachers/organisors of CiTAngo welcomed Rob as Tango DJ for their milonga on May 10, 2009. Rob & Sonja at the set of a Nescafe commercial. 20 tangodansers and 10 musicians and many extra's created a flashback of a salon de tango from the 40's. On request of KPN, Torito Event organised 20 advanced Tangodancers and the best teachers in the Netherlands for a tango dance lesson to the award winning top employees, and a dance performance. Tango in the Old Church ( de Oude Kerk ), in the centre of Amsterdam. 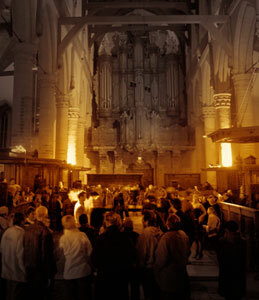 Organised by de Oude Kerk for the Museum Night of 2004. Torito Event advised, invited the dancers, organised the musicians and the DJ. Luna de Tango is a foundation that organised various Tango events to raise money for projects in the poorest neighbouhoods of Buenos Aires. Rob is the president of the board (4) of Luna de Tango. To introduce an Argentine Tango couple to the tangueros of the Netherlands, tangosalons with short lessons were organised. Rob & Chi-E (from Japan) gave workshops in Sunderland, England. Torito Event organised a Tango performance on request of Hete Herfst (a protest against the choices in budget cuts by the Dutch government). Rob & Patty (van Hoften), improvisation at the Academia de Tango, Amsterdam. 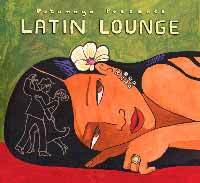 Music: La Cachila, by Osvaldo Pugliese. November 2009. Photo © Bert Verleur. Couple taking a private lesson in Rob's home. 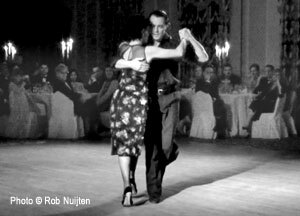 for this worldfamous and very inspiring dancer and his dance partner Maria Plazaolla, Rob organised a special Gran Salon de Tango in Grand Cafe De Kroon in Amsterdam, during their first incidental visit to the Netherlands. The Dutch tango dancers came from all over the country, on a wednesday night, to see their dance performances, and enjoy the dance night. Gavito and various partners were then asked to teach at the Tangomagia festivals in Amsterdam. Carlos Gavito regretfully passed away July 1st 2005. As long as his legs supported him he inspired many with his sensual dance, done with immense feel for the music. For a party in Scotland, Torito Event was chosen to put a dinner show together, with mainly Tango. The show was realised with a group of 4 tango dancers and 10 musicans, originally from Argentina, USA, Russia, the Netherlands, Germany and Scotland. The musicians played Argentine Folk and Argentine Tango, Jazz, Klezzmer. Rob & Jolanda danced at 'Reflejo de luna' (by alacran) at the launch of the CD 'Latin Lounge' (label Putumayo) in the Sugar Factory in Amsterdam. immediatly enthusiastic about the arrival of this elegant dancer in Amsterdam, Rob became the agent of him and Christiane Palha, for the time of Ernestos stay in the Netherlands. Then they joined Toneelgroup Amsterdam to dance in the theatreplay 'Romeo and Julia' in the role of Paris and Julia, after which Ernesto returned to Buenos Aires. Rob & Sonja (Germany) were teaching a serie of classes in Amsterdam. 2002-2003. 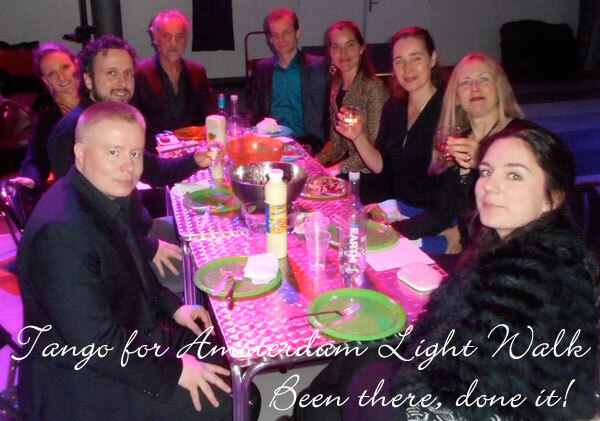 At a highschool in Harderwijk, Rob gave a Tango dance class, assisted by Sonja Mildner. 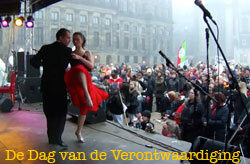 Rob & Gabriëlle Nederend danced in the show 'Olé Tango!'. With this show they visited 35 theaters and concert halls in the Netherlands. 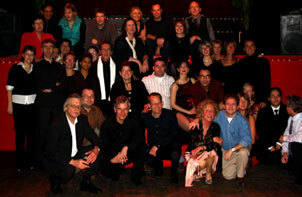 At the Tangoschool Amsterdam they taught 3 levels of regular classes (2001). Show in Royal Theatre Carré, Amsterdam. Rob & Machiko raised money for human rights organisations in Argentina, as that being a part of the Alternative National Gift to crown prince Willem Alexander and prinses Maxima, when they married. No Tango Royal. Rob and his dancepartner Gabriëlle were invited, before that, to do a dance performance and a dance lesson at a party of crown prince Willem Alexander and his bride Máxima, 2 days before they married, but Rob declined. There were two reasons for that: Rob thinks princes and princesses, kings and queens are fairytale figures like Sint Nikolaas and Santa Claus (sorry, children) that Rob refuses to say 'your highness' to. Also, the head of state should be chosen democraticly. It is rather silly to give a lady the status of a princess, just because of her marriage to a man, who, just simply by birth, was given a status of crown prince, and then simply start to cheer them and gasp at them as if they did magnificent things. The second reason for decline, was the possibility that Jorge Zorreguieta, father of the bride and important member of the murderous government of the formar military juntaleader Videla (Argentina) could attend this party, at a royal palace in The Hague. Rob is instead a supporter of the H.I.J.O.S. Holanda, children of the missing and murdered, victims of Zorreguietta and his compañeros en lo malo. Rob & Jolanda practising in the Vondelpark Open Air theatre in Amsterdam. In the first edition of the new Dutch lifestyle programm' Cheers', Rob & Jolanda gave a dance lesson in a television broadcast about painter Tessa van der Voort, who paints Tango and flamenco dancers. 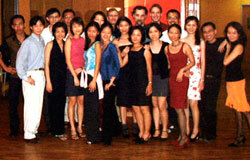 Rob taught workshops and private lessons in Singapore.